I live in Paisley, just outside of Glasgow. Estate agents would call the town up and coming, which is shorthand for “it’s a bit rubbish but it’s been worse”. So I do not live in a sprawling, open, luxury apartment. And I don’t get many opportunities to wander around one. Though walking around a stranger’s home is not really on the top of my list of priorities. That said, I wouldn’t mind a nosey around a virtual one that looks almost like the real thing. 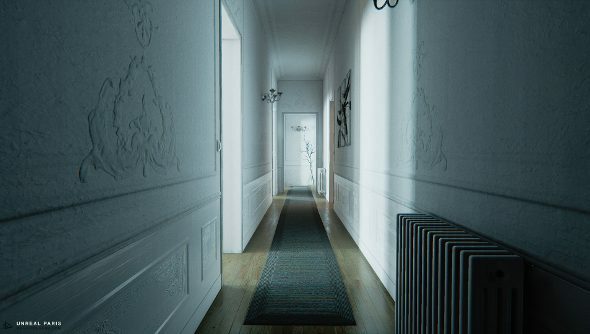 Dereau Benoit, whose credits include Dishonored, has been fiddling around with Unreal Engine 4, and he’s constructed a startlingly realistic apartment. A Parisian flat – it doesn’t sound impressive. But it looks impressive. And all built using an engine that you can get for less than $20 a month. With affordable engines like Unity, Unreal Engine and CryEngine, the days when we had to look toward only AAA developers for the fanciest looking games is pretty much at an end. The most striking game I played last year was The Vanishing of Ethan Carter, not something made by a team of 100. You can download Benoit’s creation here, but he’s temporarily taken it down while he fixes some bugs.